What does this have to do with Westlife’s bizarre Christmas Number One cover of Terry Jacks’ “Seasons In The Sun”, which brings the curtain down on the 1990s, and on the 20th Century’s charts? Only that, as the band tightened their apparent grip on pop, a dark suspicion grew that we had all been stranded in a recursive process – that time had looped round to the 1970s, an era of novelty hits, holiday imports, and doe-eyed crooners. Or even the 50s, when groomed, polite and stifling boys had made the pop running quite as much as rock’n’roll had. The style has changed a little since 1952 – gospel, doo-wop and soul are in Westlife’s mix, however faintly, and light opera is no longer a pop aspiration – but the manner has not. Between the first number one and the 844th, the level of smarm is depressingly constant. To say that is only to repeat something which became obvious very early on in the Popular project – that the set of uses people find for pop singles stays largely the same. Dancing, loving, self-definition, and souvenirs – that covers eighty percent of it, I’d say. And that’s fine – the game is in the detail of each variation. What seemed different about Westlife was that they were so desperate to smooth out and file off such detail: occasionally, more often in their videos, you’d catch onto something that fixed them in time, but their records rarely had any such grain to them. What wasn’t clear in 1999 was how the unbearable blankness of Westlife was only one version of a question set to haunt Popular for the next decade or more: what, exactly, does Simon Cowell like about music? What does he think pop should be? In his choices of what to promote and record, Cowell – still a backstage figure at this point – gives a strong impression that he thinks rock music was, all in all, a bad idea, that the most natural and profitable form of pop is the kind of light entertainment represented by big-voiced stars and impresarios, or at the sophisticated end bandleaders and crooners. If Westlife do hark back to 50s pop, I suspect it was partly instinctive. Cover versions are a very obvious strategy for the group, and one that paid off at once: after “Flying Without Wings” had scraped a number one, “Seasons” and “I Have A Dream” did the job at Christmas easily, and held on for several weeks. The covers chosen for this single represent how the light entertainment tradition survived into the 1970s – they are the decade at its soggiest and broadest. “I Have A Dream”, children’s choir and all, is ABBA’s worst single – from an album where they sound wrong-footed by disco, second-guessing themselves, and then breaking their unsteady flow with this relative clunker. It sounds like it was a commission – UNICEF, or Children In Need before the fact – but as far as I know it’s just Benny and Bjorn trusting, as usual, that their melodic gifts will redeem their cornier impulses. For once, they get it wrong. It’s pretty, though, and Frida – battening the hatches of faith to keep out the winter darkness of late ABBA – is as magnificent as ever. But Westlife’s version is no abomination. The inevitable boyband ad libs find a new, more celebratory, take on the song, breaking down the slight church hall prissiness in ABBA’s verses. Though in a song where almost every note is oversung, there’s no longer anything special about the original’s one beautiful moment, the held “I believe….in angels”. But wait a minute. “I Have A Dream” is about finding strength in faith, but specifically the strength to conquer and meet the fear of death: “When I know the time is right for me, I’ll cross the stream”. 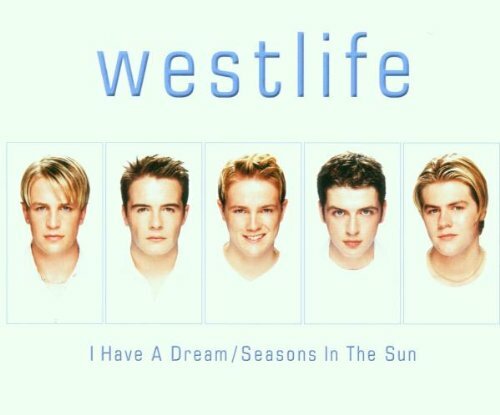 Which brings us to “Seasons In The Sun”, in which, on the eve of the Millennium, Westlife conjure their own apocalypse by bringing the death ballad back to the UK charts. If it’s a startling move on the band’s part, it’s made even weirder by the professional gusto with which the lads approach “Seasons”. If “I Want It That Way” cut up boyband song lyrics to prove that resonance in them came from texture not text, “Seasons In The Sun” goes the only possible step further: after a sombre first minute or so, the fog of instrumental blarney clears, the group shake off their long faces and “Seasons”’ boyband moves run exactly against its supposed ‘meaning’. Lines about loss and death are sung in the precise way any love song would be: “Goodbah Michelle it’s hard to diy-iy-iy!”. Even Terry Jacks’ smash-and-grab job on Brel didn’t go that far. Factor in the song’s own recursive stairway to heaven – those monstrous, tiered key changes piping you further up and further in to Simon’s Country – and you have a song that’s almost as awesomely wrong-headed as “The Millennium Prayer”. And this is how, despite Cowell’s efforts, pop music can fight back against his attempts to reduce it and iron out its creases. The seven weeks of Cliff and Westlife are, you could fairly claim, the darkest hour we have faced so far: two records where self-satisfied calculation meets cack-handed execution. They are terrible singles. And still some kind of oddness, some novelty, can poke through, even in Cowell’s home territory, the micro-managed world of Westlife. We had never heard Auld Lang Syne spliced with The Lord’s Prayer before. We have never heard a death ballad flambéed in insincerity, boyband style, either. It turns out that hearing these things is stupid and awful. But they are new. The charts can survive stupid and awful: predictability, the endless loop of pop’s Cowellian afterlife, will be the real enemy in the years to come. Popular will return on February 1st. Let’s all meet up for the year 2000. @mapman, 22. Thanks for the correction, and, I agree that ‘Smooth’ isn’t terrible (so my ‘reign of terror’ was in jest). But I do remember being puzzled about the whole Santana-upswelling at the time and quite how Mr Matchbox 20 was in a position to facilitate that resurgence. In general too, while the top of the UK charts is ridiculously fragmented at this point the US charts needed an enema. Using Erithian’s lovely figures we can calculate that a similarly diligent US-Tom starting where Tom was a year ago (July ’96) would already be up to February/March 2005! #31 Agreed. One of the reasons I’ve continued to take interest in the UK charts all this time is the Hot 100 moves way too s-l-o-w-l-y. And once a certain artist finds the Hot 100 sweet spot, they seem to dominate the chart 24/7/365 for a while (Santana in 99/00, Taylor right now, many other examples in between). Of course, 30-40 number ones a year is a bit extreme on the other end. One national chart that does have what I consider an ideal amount of turnover is Australia. I don’t know if this is more appropriate here or in the 90’s poll, but as we bid farewell to 1999 we can begin to make out, on the horizon, a development with even greater import for the pop landscape than the arrival of Simon Cowell: file-sharing. 1999 is the year Napster was launched, picking up millions of users practically overnight, with it reaching popular notoriety in the US as early as May 2000 (after the Metallica incident – which I’m sure we’ll discuss soon enough). The Bitorrent protocol was designed the following year, in 2001. Blogging Without Wings determined that the Wezzas’ I Have A Dream is marginally better than the ABBA version (this still doesn’t make it much good) and Seasons In The Sun is our first real stinker. That reference to The Last Battle is incredibly apt for Seasons In The Sun. Both may be unrivalled in their spheres for crassness in the face of death, and if the Narnia film series ever gets that far, Seasons (Jacks or Westlife version) should absolutely soundtrack the “further up” scene. I was at a quiz tonight, and one of the questions was: what was the No1 record at the turn of the millennium? And I thought, I know I’ll know that… But I didn’t. @37 No, technically and to the kind of people who compile pub quizzes it wouldn’t be this one. Re38: They weren’t pub quiz compilers – it was set by showbiz journalists. And if you mean NYE/D 2000/1 vs 1999/2000, they definitely meant this one.